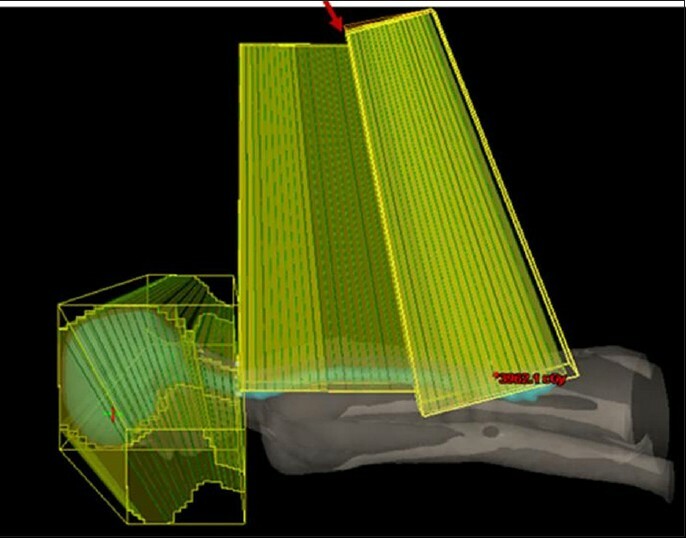 A new planning method for Craniospinal Irradiation by Eclipse treatment planning system using Field alignment, Field-in-Field technique was developed. Advantage of this planning method was also studied retrospectively for previously treated five patients of medulloblastoma with variable spine length. Plan consists of half beam blocked parallel opposed cranium, and a single posterior cervicospine field was created by sharing the same isocenter, which obviates divergence matching. Further, a single symmetrical field was created to treat remaining Lumbosacral spine. Matching between a inferior diverging edge of cervicospine field and superior diverging edge of a Lumbosacral field was done using the field alignment option. 'Field alignment' is specific option in the Eclipse Treatment Planning System, which automatically matches the field edge divergence as per field alignment rule. Multiple segments were applied in both the spine field to manage with hot and cold spots created by varying depth of spinal cord. Plan becomes fully computerized using this field alignment option and multiple segments. Plan evaluation and calculated mean modified Homogeneity Index (1.04 and 0.1) ensured that dose to target volume is homogeneous and critical organ doses were within tolerance. Dose variation at the spinal field junction was verified using ionization chamber array (I'MatriXX) for matched, overlapped and gap junction spine fields; the delivered dose distribution confirmed the ideal clinical match, over exposure and under exposure at the junction, respectively. This method is simple to plan, executable in Record and Verify mode and can be adopted for various length of spinal cord with only two isocenter in shorter treatment time. Medulloblastoma occurs in cerebellum, a portion of the brain that plays vital role in coordinating muscular movements. Approximately twenty percentages of all primary Central Nervous System tumors are medulloblastoma among children less than 19 years of age with peak incidence between 5 to 9 years and most commonly seen in pediatric male. Craniospinal Irradiation (CSI) is used for treatment of medulloblastoma and other brain tumors, which tend to spread via Cerebrospinal Fluid (CSF). Generally in CSI for medulloblastoma of two laterally opposed cranial fields, are matched to a posterior spine field with the potential for dose in homogeneity at the junctions. Hence, elder children and adults frequently require two posterior spine fields which lead to additional junctions and planning complexity. Traditionally symmetrical bilateral cranial field and posterior spine field are planned to cover entire length of Planning Target Volume (PTV). The both fields are matched either by gap junction method or by rotating couch and collimator ("Exact-match" technique). For Gap -Junction method the Spine field is separated from the cranium field by the distance S, which is calculated from the equation S = 0.5 × L × (d/SSD). L is length of spine field, SSD is "source to surface distance" and d is the "depth" at which both field to be matched. In the second method, a diverging (symmetric) cranium and spine fields are used for whole length of PTV. Here the caudal field margin of the bilateral cranium field is made parallel to cephald margin of the spine field by rotating collimator and couch. The angle of collimator rotation θcoll. = arc tan (0.5 × L × (d/SSD) and couch rotation is calculated using the formula θcouch = arc tan (0.5 × L × (d/SSD). If the cranium field is no divergent simple collimator rotation is sufficient to match both the fields. The above described classical method of field edge matching is being followed in most of the hospitals while performing CSI. In this traditional method, the junction between cranium and spine field and between spine fields shall be shifted twice with a extension of 0.5-1 cm upon delivering every 8-12 Gray (Gy). This shifting of the junction is called as feathering technique by which the inferior margin of the cranial field is shortened and the superior and inferior portions of spine field edges is extended. Such feathering technique necessitates the recalculation of gap width for gap junction method and rotational angle for "Exact matching" technique manually, which may result in error of propagation. Following the above procedure leads to the process similar to that of new planning and new plan execution inclusive of isocenter shift. A drawback with the couch rotation of cranial field is that the contra lateral eye can be displaced in cephald direction, which makes blocking of frontal of brain tissue at the cost of saving eye lens that needs special attention. Target volume coverage with no risk of excess dose to critical organ is also a difficult task in CSI so it is necessary to find the simple and safest method to match the divergence of two fields for desired therapeutic benefit. Patients were immobilized in prone position with thermoplastic mask system as shown in [Figure 1]. Prone head rest is used with head immobilization mask and in addition to that foam block of 10-15 cm thickness used in the abdomen region to straighten the spine. A Computed Tomography (CT) scan was acquired on a Wipro GE CT scanner of 3 mm slice thickness, from the top of the skull to the base of the spine in the treatment position with immobilization devices. Three reference CT markers (one sagittal and two laterals) were placed during simulation on thermoplastic cast, which shall be used for shifting the patient position to treatment isocenter. The Isocentric shift from reference CT markers was calculated from TPS. The CT scan images were imported and the Target Volumes were contoured along with the Organ At Risks (OARs). The Clinical target Volume (CTV) includes entire brain and its meningeal coverings with the CSF, spinal cord and the leptomeninges up to Lower border of the Thecal sac and PTV was created by adding a safety margin of 0.5 cm from the CTV. The OARs contoured for plan evaluation was the Right and left Eye, Heart, Right and left Kidney, Right and left Lens, Liver, Right and Left lung, spinal cord, and spleen. Parallel-opposed cranial fields were planned using asymmetric Jaw by keeping the isocenter at the cervical spine. In addition, multi leaf collimators (MLC) were used to confirm the field to the PTV and to shield the critical organs. The lateral fields were used to treat the brain and they were fixed in length approximately Y2 = 20 cm and Y1 = 0 cm (half beam blocked from the isocenter to provide a non-divergent junction with the posterior spine field, which obviates couch and collimator rotations as shown in [Figure 2]. Matching the upper border of the spine field to the lower border of the cranial field requires strict attention to achieve the accuracy, overlapping of the spinal field to cranium (i.e. overdosing) may lead to catastrophic outcomes for the patient. , Uncertainty of dose distribution in this sensitive region is eliminated by adopting half-beam blocked fields. Spine field was splitted into Cervicothoracic and Lumbo sacral field. It shares the same isocenter of cranial asymmetric field. The cranial portion of the field is blocked (Y2 = 0 cm) up to the isocenter during irradiation of upper spine field. Multi leaf collimators are placed in the beams eye view for additional shielding of the critical organs such as Lung and Heart. Homogeneous dose coverage in the cervicothoracic spine field is achieved by field-in-field method. In this technique, two to three subfields are created and weighting is adjusted to remove the hot and cold spot created by sloping surface and variation of the depth of spinal cord along its length. This asymmetric half beam blocked cranium and spine field totally eliminates the problem of junction where the physicist used to spend more time. This is the symmetrical field with isocenter at the mid of the Lumbo sacral spine. The MLCs are placed for additional shielding of critical organs. Here the inferior diverging edge of the Cervicothoracic (Y1) and superior diverging edge of the Lumbosacral fields (Y2) are to be matched. For that, a new plan is created which contains lumbosacral field and copy of the Cervicothoracic field. Unmatched spine fields are shown in [Figure 3]. Here the field alignment option plays a vital role of matching the above two planes for reaching a uniform dose distribution over large volumes, for example in breast, and head and neck treatments. Open fields can be aligned to form smooth junctions with other fields. 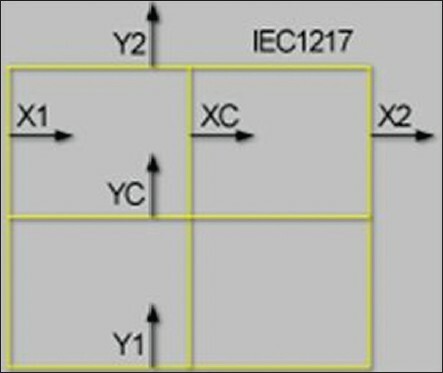 As per IEC 1217 each field contains 6 planes shown in [Figure 4] that can be matched with other field planes using field alignment option in the Eclipse TPS (X1, X2, Y1, Y2, XC, and YC) that can be aligned with another field's planes. For that field alignment rule has to be defined. Rule can be defined in such a way that, any two planes of the adjacent fields has to match in parallel or opposite manner. Optionally any one field can be defined as the Master Field. So, except master field, all other defined fields are adjusted according to the rule. In this study, field alignment rule was defined in such a way that Inferior edge of the Cervicothoracic field (Y2 plane) and superior field edge of Lumbosacral field (Y1 Plane) to be matched as shown in [Figure 5]. Same rule was used for all the patients studied. According to the rule, both planes were matched automatically by rotating the couch, gantry and collimator of the Lumbosacral field by keeping superior spine field as a master field. In the Lumbosacral field, the couch was rotated to 270 degree, collimator to 90 degree and the gantry was rotated to 17 degree. Similarly, the detail of lumbo sacral field corresponding to various length of spinal cord required for field matching with Cervicothoracic spine is given in the [Table 1]. Both the diverging planes (Y2 and Y1) are perfectly matched and verified in the sagittal plane and cone views of the field shown in [Figure 6]. Due to deep concave nature of sacrum, it is difficult to achieve the 95% coverage with single open Lumbosacral Spine Field. Hence, additional segments (Subfields) were added with Enhanced Dynamic Wedge (EDW) to achieve the homogeneous dose distribution. Minimum degree of wedge angle like 10 degree were usually added. EDW is an optional and not used for all the cases studied when the subfields were sufficient to achieve the desire dose distribution. The application of symmetric field with maximum possible length of 40 cm in the lower spine region (Lumbosacral) made this planning methodology feasible for various spine length of five more patients treated in our institute. Dose Volume Histograms were used to evaluate the dose to critical organs and dose distribution was analyzed for homogeneity. DVH of critical organs and PTV is shown in the [Figure 7]. Average Mean Dose to critical organs of six patients were tabulated in [Table 2]. Maximum dose to spinal cord and lens was evaluated to be within tolerance and was observed that maximum dose to spinal cord is 38.55 Gy ± 0.41 and lens maximum dose 5.16 Gv ± 2.7. Plan was approved by the clinical oncologists and executed in the Varian Clinac DHX machine with the help of Record and Verify (RV mode) system. The longitudinal distances between two isocenters was taken as a reference and was reproduced daily. With RV mode and digital couch parameters Technologist was able to reproduce the treatment position with negligible setup error. Dose at the junction of spinal fields in which the field alignment option was introduced were verified by using Ionization chamber array (I'MatriXX, Scanditronix Wellhofer GmbH, Germany). It consists of array of 1020 vented ionization chambers in two-dimensional (2D) grid of 32 × 32 and offers real time measurements. The effective point of measurement lies at 3 mm below the front surface. 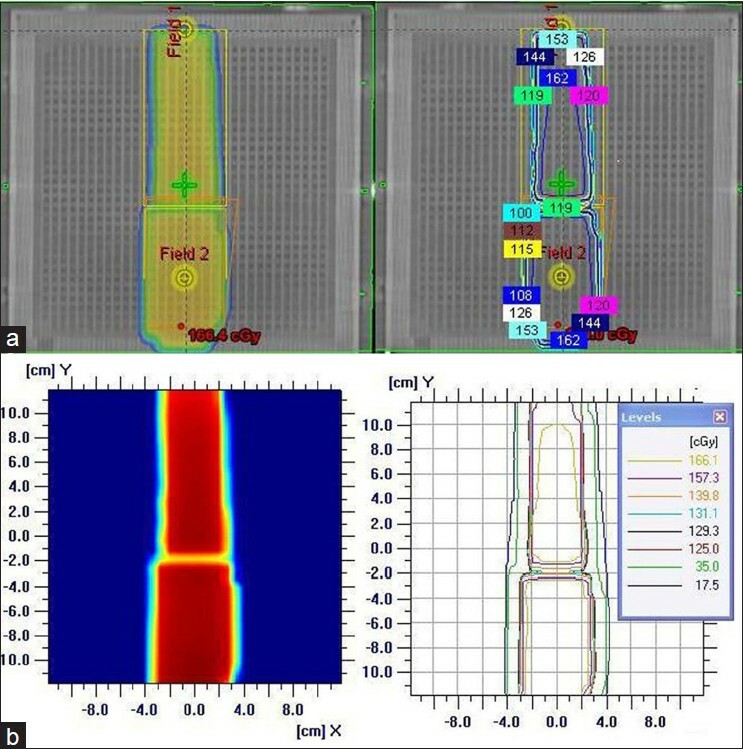 Hence, 4.7 cm of solid water phantom was used to perform the measurement at the depth of 5 cm (SAD-100 cm) and same was simulated for the planning purpose. In 2002, Jeff Michalski introduced a method for verification of field junction using mini verification film and irradiated with a mock treatment developed. Similarly, a mock treatment plan which mimics spinal field geometry was created in the TPS for the I'MatriXX. The field geometry consists of superior and inferior spines, which was placed in the 3D images of simulated Imatrix with phantom. These both fields were matched using field alignment option by matching the divergence planes. To evaluate the dose error with incorrect field matching 2 mm overlapped fields and 2 mm gap junction fields were intentionally created. A single frontal dose plane at the depth of 5 cm was transferred to the treatment unit for delivering 180 cGy at 3 cm depth and measured in I'MatriXX associated with solid water phantom by maintaining simulated setup. Necessary calibration for the device was done before doing measurement. A delivered fluneces for matched, overlapped and gap fields were shown in the following figures. [Figure 8]a shows ideal clinical match between two fields using field alignment option. Planned flunece across the junction of matched field shows 93% dose distribution at 5 cm depth. [Figure 9]a and b shows an intentional overlap of 2 mm causes the dark line with unacceptable over exposure of maximum 122% at the junction. [Figure 10]a and b shows a linear region of under exposure of due to intentional gap of 2 mm between the fields and dose at the junction is around 66% of prescribed dose only. By comparing [Figure 8] with [Figure 9] and [Figure 10] it is clear that the matched fields resulted in smooth dose variation across the junction without over and under exposure and it is ensured by quality assurance done with I'MatriXX. The mean deviation between planned and delivered dose delivery is within 3%. So, the field matching can be maintained throughout the treatment delivery using fixed field parameters and fixed longitudinal distance between isocenter. To overcome the inaccuracy of feathering various methods are introduced in last two. Decades, such as scanning couch technique, rotation of treatment table and extended source to skin distance. Helical tomotherapy and proton based delivery methods also introduced with advantage of conformal dose distribution. But, these methods are very limited availability and are not in widespread use. The method of extended SSD also requires additional effort to achieve optimum dose distribution, since dose rate decreases with SSD. 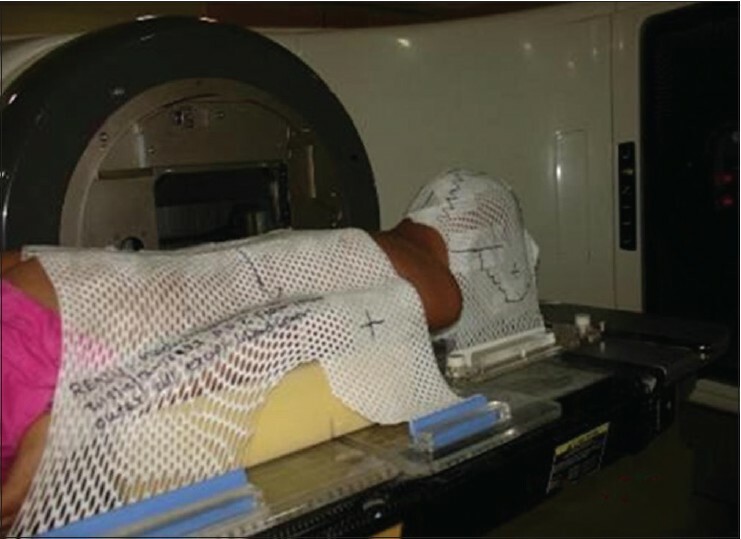 Feasibility of CSI with Intensity Modulated Radiotherapy (IMRT) plan and other modern treatment modalities were also studied by many authors and most of the studies resulted in improved dose homogeneity and coverage. Hall et al., in 2006, studied about the risk of secondary cancers associated with IMRT and protons and revealed that due to increase in Monitor Unit (MU) and dose distribution changes, the risk of secondary cancers is doubled with IMRT compared to 3D Conformal RT. Long-term toxicities and clinical benefit of these techniques can be documented for future applications. Instead of performing three Isocentric plan for elder children and adults, and by adopting this described planning method spinal cord of greater than 45 cm can be treated with two isocenter requires only longitudinal shifts, which reduces the staff entry to the treatment room as well as treatment delivery time. The use of CT based planning in the Eclipse TPS improved organ delineation and field alignment workspace offered the great advantage of matching two field edges, which reduced the planning time. 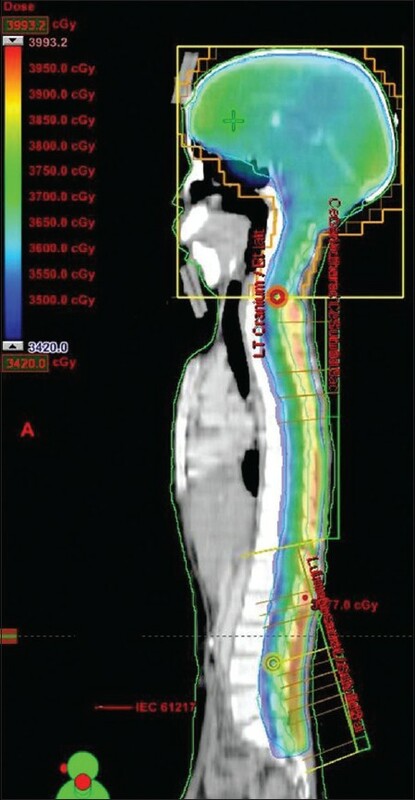 Using field-in-field technique and EDW the hot and cold spot created by the concave nature of spinal cord is managed and homogeneous dose distribution is achieved. The 95% dose coverage of entire PTV is shown in [Figure 11]. Wherein it is also noted that the maximum hot spot 110-111%, which occupies lumbar spine region and found that this volume is insignificant. This is the greatest advantage of this methodology when compared to split field IMRT described by Seppala et al., where the hotspot varies from110-120% in the most sensitive cervical spine region. 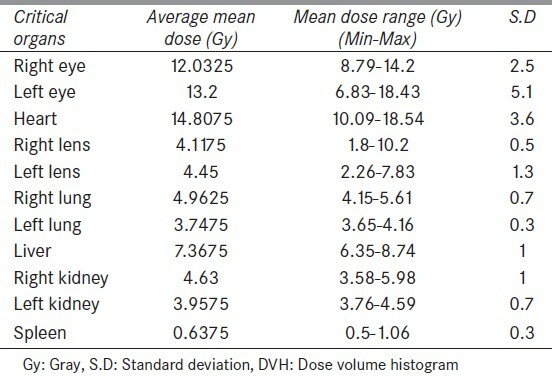 The mean homogeneity index (modified) for PTV is calculated and shown in [Table 2] using the formula D5/Dp and (D5-D95)/Dp, where D5 and D95 is dose to 5% and 95% of target volume, respectively and Dp is prescription dose. 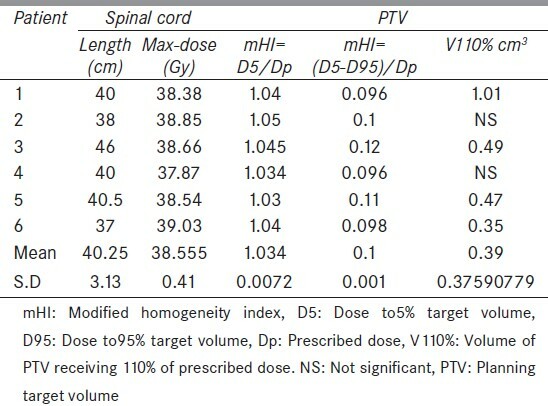 Calculated homogentiy index and Max spine dose for the six patients of variable length of spine studied is given in the [Table 3]. Also the volume of PTV receiving dose above 110% is included in the Table. From the Table 2, the mean value of modified homogeneity Index (mHI) 1.04 and 0.103 shows that the dose distribution is highly homogeneous in PTV. The Maximum dose to spinal cord is well within the tolerance limit, since the field matching is accurate in the junction. V110-Volume of PTV receiving 110% of prescribed dose was calculated and found that values were insignificant for the range of spine length studied. 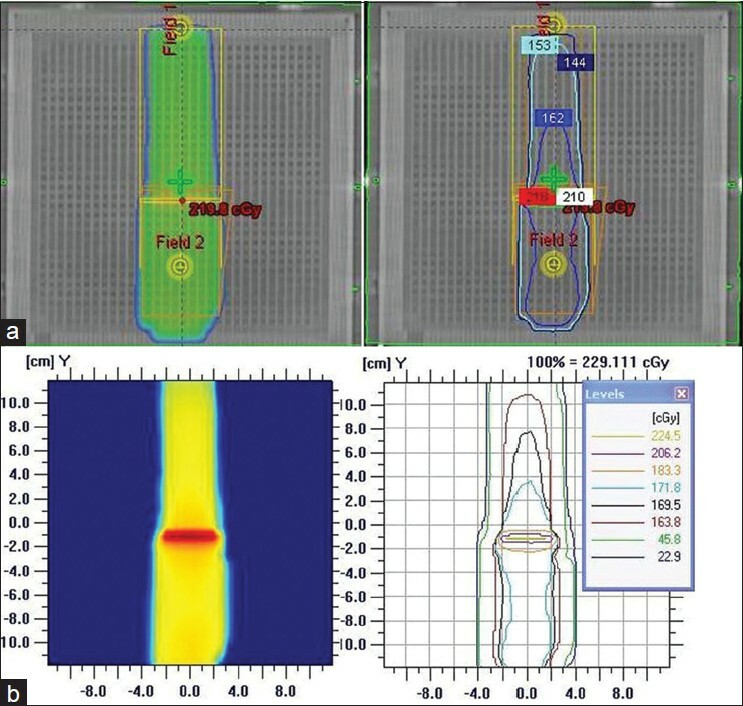 Dose verification done at the field junction using Imatrix also ensured the accurate field matching while delivery and dose varies smooth across the junction compared to overlapped and gap field geometry. So, this new method of field matching offered by Eclipse TPS suits for various length of spinal cord irradiation and can be adopted for field matching in Breast, Head and Neck and wherever the field matching is required. This simplest method of CSI can be done with the help of Eclipse treatment planning system. Planning with two isocenter suits for various length of spine and reduced the planning complexity. Introduction of field alignment option is useful for many physicists for matching planes of adjacent fields. The plan evaluation and calculated mean homogeneity index value of 1.04 and 0.103 reveals that no critical organ receiving excess dose in the junction and dose to PTV is homogeneous which offers better therapeutic ratio. 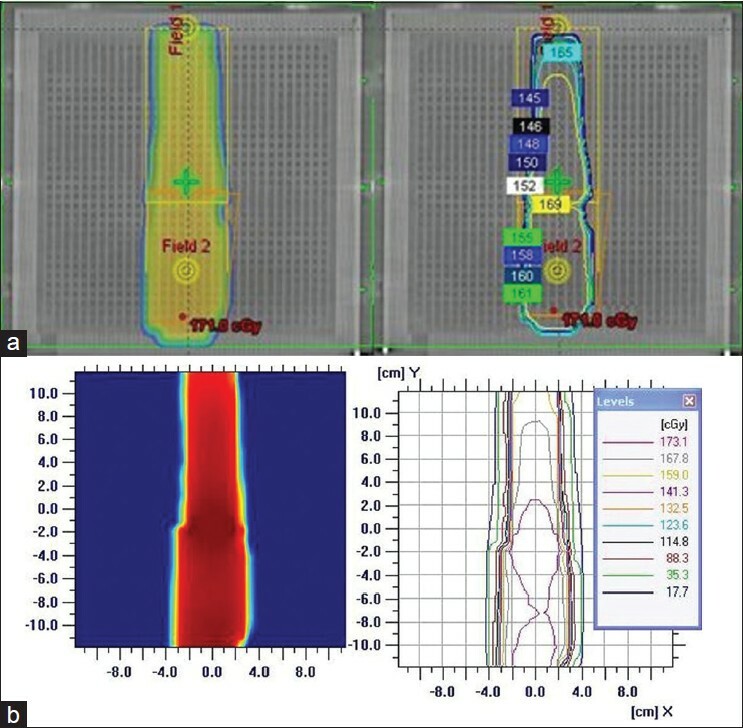 The plan verification process done at the spinal field junction also ensured that dose varies smooth across the junction of spinal field, where the field alignment tool is used. From the experience of technologist, this plan was simple to execute with minimum setup error using the digital couch parameters and RV system. Finally, this fully computerized treatment plan and delivery reduced the overall planning as well as treatment time with increased accuracy. Any dosimetric effect of setup error using this planning method can be studied in more future prospective studies by film dosimetry. The author would like to thank all the consultants in the Department of Radiation oncology and Special thanks to Mr.Raju Thomas( Radiotherapy Technologist). Acharya Tulsi Regional cancer treatment and Research Institute, Bikaner. Lpomeroy S. Clinical presentation, diagnosis, and risk stratification of Medulloblastoma. Up-to-date [Internet]. 2014 Feb. Available from: http://www.uptodate.com/contents/clinical-presentation-diagnosis-and-risk -stratification-of-medulloblastoma [Internet] [Last accessed on 2014 Mar 19. McMahon RL, Larrier NA, Wu QJ. An image -guided technique for planning and verification of supine craniospinal irradiation. J Appl Clin Med Phys 2011;12:3310. Holupka EJ, Humm JL, Tarbell NJ, Svensson GK. Effect of set up error on the dose across the junction of matching cranial-spinal fields for the treatment of medulloblastoma. Int J Radiat Oncol Biol Phys 1993;27:345-52.
del Charco JO, Bolek TW, McCollough WM, Maria BL, Kedar A, Braylan RC, et al. Medulloblastoma: Time-dose relationship based on a 30-year review. Int J Radiat Oncol Biol Phys 1998;42:147-54. Carrie C, Hoffstetter S, Gomez F, Moncho V, Doz F, Alapetite C, et al. Impact of targeting deviations on outcome in medulloblastoma: Study of the French society of pediatric oncology (SFOP). Int J Radiat Oncol Biol Phys 1999;45:435-9. Yoon M, Park SY, Shin D, Lee SB, Pyo HR, Kim DY, et al. A new homogeneity index based on statistical analysis of the dose-volume histogram. J Appl Clin Med Phys 2007;8:9-17. Michalski JM, Klein EE, Gerber R. Method to plan, administer, and verify supine craniospinal irradiation. J Appl Clin Med Phys 2002;3:310-6. Yom SS, Frija EK, Mahajan A, Chang E, Klein K, Shiu A, et al. Field-in-field technique with intrafractionally modulated junction shifts for craniospinal irradiation. Int J Radiat Oncol Biol Phys 2007;69:1193-8. Halprein EC. Impact of radiation technique upon the treatment for medulloblastoma. Int J Radiat Oncol Biol Phys 1996;36:233-9. Kiltie AE, Povall JM, Taylor RE. The need for the moving junction in craniospinal irradiation. Br J Radiol 2000;73:650-4. Chang EL, Wong PF, Forster KM, Petru MD, Kowalski AV, Maor MH. Verification techniques and dose distribution for computed tomographic planned supine craniospinal radiation therapy. Med Dosim 2003;28:127-31. Carrie C, Alapetite C, Mere P, Aimard L, Pons A, Kolodie H, et al. Quality control of radiotherapeutic treatment of medulloblastoma in a multicentric study: The contribution of radiotherapy technique to tumour relapse. The French Medulloblastoma Group. Radiother Oncol 1992;24:77-81. Hall EJ. Intensity-modulated radiation therapy, protons, and the risk of secondary cancers. Int J Radiat Oncol Biol Phys 2006;65:1-7. Parker WA, Freeman CR. A simple technique for craniospinal radiotherapy in the supine position. Radiother Oncol 2006;78:217-22.